The CURLIN-AIR was initially developed to ultrasonically inspect an evergrowing class of materials/products that are too attenuative to inspect with conventional (Megahertz frequency) ultrasonic flaw detectors. However, because of its noncontact airborne beam feature, CURLIN-AIR, also, offers applications advantages for certain materials/products (Samples) that are routinely inspected with conventional equipment. Refer to the Application Notes (AN) which are published on an ongoing basis for CURLIN-AIR. The unique performance of CURLIN-AIR sometimes may seem amazing, especially to those who have had experience with conventional ultrasonic flaw detectors, as well as those who could not find a practical means to nondestructively inspect their particular product. Neglecting actual performance levels/details, it almost becomes an issue of what CURLIN-AIR's ultrasonic beam can't "punch through", rather than what it can punch through. The object of this Tech Note is to briefly explain, in simple and general terms, how & why it works. high enough so satisfactorily small-diameter, well-collimated ultrasonic beams can be generated by acceptably small-sized probes (transducers). The 1.9" OD Model ATI Probe has an effective beam diameter of about 1 3/8" at the probe face, with a beamspread of only about 91/2° (half-angle at - 20dB). Tone Bursts: Generate pulsed ultrasonic energy in the form of rapidly reoccurring tone bursts (cycle packets at the 50KHz test frequency) which possess the necessary duration (pulse length) and amplitude to deliver the desired "penetration power", yet eliminate/minimize standing wave interference. Sensitivity: Provide the high levels of low-noise adjustable amplification needed (up to 100dB or 100,000X) to compensate for the large amount of ultrasonic energy lost by reflection at both material surfaces (airborne ultrasound experiences an exceptionally large acoustic impedance mismatch at air-solid interfaces - far greater than the liquid couplant-solid interfaces experienced with conventional flaw detectors). Special Probes (Transducers): Provide exceptionally effective energy coupling to transfer satisfactory levels of ultrasound into and back out of the air. An easy way to initially visualize what's happening ultrasonically and why flaws are detectable is to take a "trek" along with an ultrasonic tone burst (longitudinal wave mode) as it travels from the transmitter probe, through air to the material being inspected, through the material and eventually through air again to the receiver probe. Transmission Into Air: Initially, a portion of ultrasonic energy is lost (due to the transmitter probe/air impedance mismatch) as the tone burst is intially launched into the air. Airpath To Material: Once launched, the tone burst travels through the air and loses further energy due to attenuation (absorption) and beamspread (diffraction). For example, about 3dB of tone burst amplitude is lost by traveling across an airpath of 6". (There is also a "complex" radiation field, called the Near Field, which extends about 1.9" in front of the Model ATI transmitter probe). Entry Into Material: A large amount (over 99%) of the incident tone burst energy is lost due to reflection at the material surface, with only a small amount of the ultrasound actually entering the material. This reflection loss is caused by the extremely large acoustic impedance mismatch at the air-material interface. The acoustic impedance mismatch can be thought of as a "valve or shutters" which determine how much ultrasound is permitted to cross the interface (a perfect impedance match allows all the ultrasound to pass-no reflection). Travel Through Material: As this weakened tone burst travels through the flawless solid material, it experiences further energy loss caused by attenuation (both absorption and scattering, in the case of a solid), as well as by additional beamspreading. Exit From Material: The remaining burst now experiences another huge energy reflection loss (again over 99%) due to the same excessive material-air acoustic impedance mismatch as was experienced at the above-mentioned entry surface. At this point, the tone burst has lost more than 99.9% of its energy due to only the two surface reflections. Airpath To Receiver Probe: After exiting the material, the now extremely low energy tone burst experiences further attenuation and beamspread loss as it travels along the airpath to the receiver probe. Reception From Air: Finally, when this low-level tone burst impinges on the receiver probe, an additional energy loss is experienced during its ultrasonic transfer to (ultrasonic activation of) the probe. Impact Of Material Flaw: Ironically, while impedance mismatches at the two material surfaces can be consid-ered energy-stealing enemies, the large air-material mismatch caused by a flaw (delamination, split or cavity) becomes a great ally. Basically, the tone burst experiences another similar 99%-plus energy loss when it impinges on a flaw (assuming the flaw is large enough to intersect the complete beam). Even"pressed together" delaminations at this test frequency (50KHz) will still reflect 99%-plus of the signal energy (because there is a microscopically thin layer of air still present at the flaw site). Thus, the flaw "blocks" a huge percentage of the normal (flawless) tone burst energy - making the flaw readily detectable. The above-mentioned ultrasonic energy (energy intensity) losses are electronically detected in terms of overall signal amplitude losses. Signal amplitude is related to the square root of the energy intensity. In the "real world", many inspectable products create actual energy intensity losses which require compensory signal amplitude boosts by the receiver amplifier that are in the range of 1,000x to 10,000x (60 to 90dB). The gain required mainly depends upon the product's acoustic impedance, attenuation and thickness. 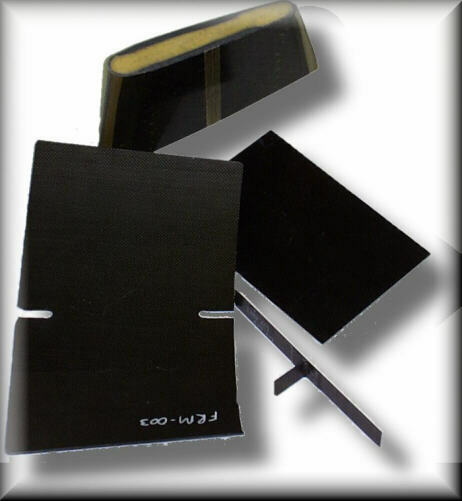 Conventional ultrasonic pulse-echo, thru-transmission flaw detectors (manual or auto-scanning) and ultrasonic bond testers are the major NDT approaches for inspecting these "advanced" graphite composite structures. The ultrasonic flaw detectors require liquid couplant (either liquid film contact or auto-scan water squirter coupling), while the bond testers require contact with either dry or liquid film coupling. CURLIN-AIR features non-contact, air-coupled ultrasonic inspection for delaminations, disbonds or in-service impact damage, provided there is access to both surfaces for use of the thru-transmission mode of testing. CURLIN-AIR can penetrate even thick sections of graphite or foam cored composites and is capable of detecting smaller-sized flaws. The tables below show CURLIN-AIR penetration levels through various thicknesses of graphite composites and the sensitivity to smaller-sized (0.3" diameter) simulated delaminations. Unlike standard flaw detectors, CURLIN-AIR can readily penetrate even thick sections of FRP and detect delaminations, certain foreign inclusions and major resin-rich or resin-starved condi-tions. The background noise is low compared to standard flaw detectors. This performance, combined with CURLIN-AIR's noncontact airborne ultrasonic beam feature, opens up many new opportunities for the inspection of FRP structures. *Note: Graphite and Kevlar fiber reinforced plastics show similar results. 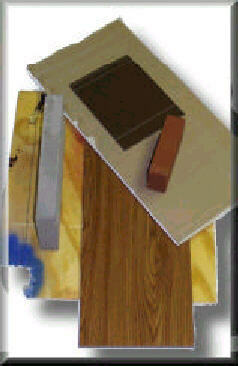 Rigid foam panels and foam core laminates that are either cast or molded. Conventional ultrasonic flaw detectors cannot penetrate these highly attenuative foams and, furthermore, manufacturers/end-users usually require non-contact scanning and no liquid couplants. CURLIN-AIR readily penetrates structural urethane foams and features non-contact, air-coupled scanning. Splits, gas cavities, delaminating, many foreign inclusions and major density deviations are readily detectable. Urethane foam panels were the driving force behind the development of CURLIN-AIR and still remains one of its best applications. 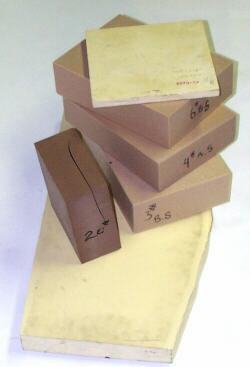 Very thick sections of urethane foams can be penetrated (and, thus, inspected for flaws). For example, a 9" thick section was penetrated using a gain level of only 73 dB (near full-scale signal). Sectional thicknesses approaching 24" may be inspectable (depending upon material properties). 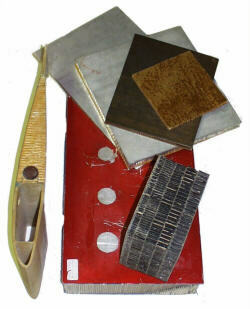 Construction Materials Such As Drywall etc. The construction products listed above are typically impractical to inspect with conventional ultrasonic flaw detectors because such materials are extremely attenuative and some can possess significant (although acceptable) material property variations. Also, manufacturers and end-users of these products typically desire non-contact testing and no use of liquid coupling. The CURLIN-AIR can penetrate these materials and detect the mentioned flaws using non-contact, airborne ultrasonic testing. Plywood can cause a noisy background for the ultrasonic signal, but larger-type blows are typically quite detectable. Aerospace, Aircraft, Airlines (In-Service Aircraft) Helicopters (Including Rotor Blades), Military, NASA, Automotive/Truck, Marine (Shipbuilding/Boatbuilding), Furniture, Construction Flooring, Cabinetry, Decks, Tabletops, Acoustical Paneling), Radomes/Antennas, Gangplanks (Industrial and Marine), Electronic Enclosures, Cargo Holders (Auto). Aerospace honeycomb bonded structures have been effectively inspected for many years using standard ultrasonic flaw detectors and bond testers. Both single-surface and thru-transmission modes are in common use. The use of contact inspection with liquid film coupling or automatic scanning with water squirter coupling is commonplace. Some bond testers feature "dry" contact testing. Single-side test methods (bond tester and ultrasonic echo-mode setups) usually need to separately scan both surfaces to detect face sheet delaminations/ voids and frequently cannot detect internal crushed/fractured core or bond lines at internal septums in multi-layered honeycomb core structures. 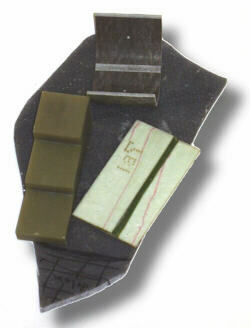 Furthermore, some of the non-metallic core material or heavier face sheets hinder conventional single-sided testing. The use of couplants and contact are generally not desired and time-consuming. In contrast, CURLIN-AIR features simplistic non-contact, airborne ultrasonic thru-transmission testing. While access is required to both sides of the honeycomb structures, all of the flaws mentioned delaminations, voids, impact damage and crushed/fractured core) are detectable - even in thick multi-layered non-metallic honeycomb structures and perforated face sheet noise abatement honeycomb structures (e.g. jet engine nacelles). 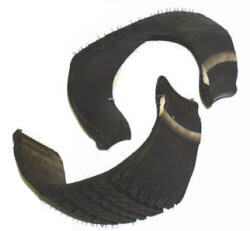 - Tapered Nomex core from approx." 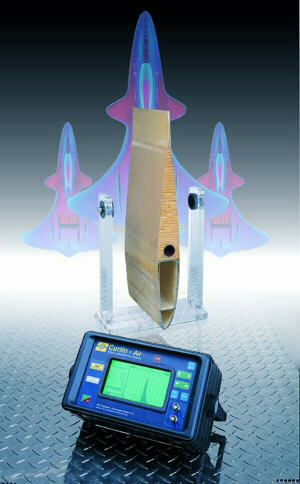 to 21/2", 0.045"
CURLIN-AIR has shown applicability for detecting delaminations in tires. Its major attractive feature is non-contact, airborne scanning. Testing can be portable or by using a fixture that rotates the tire.